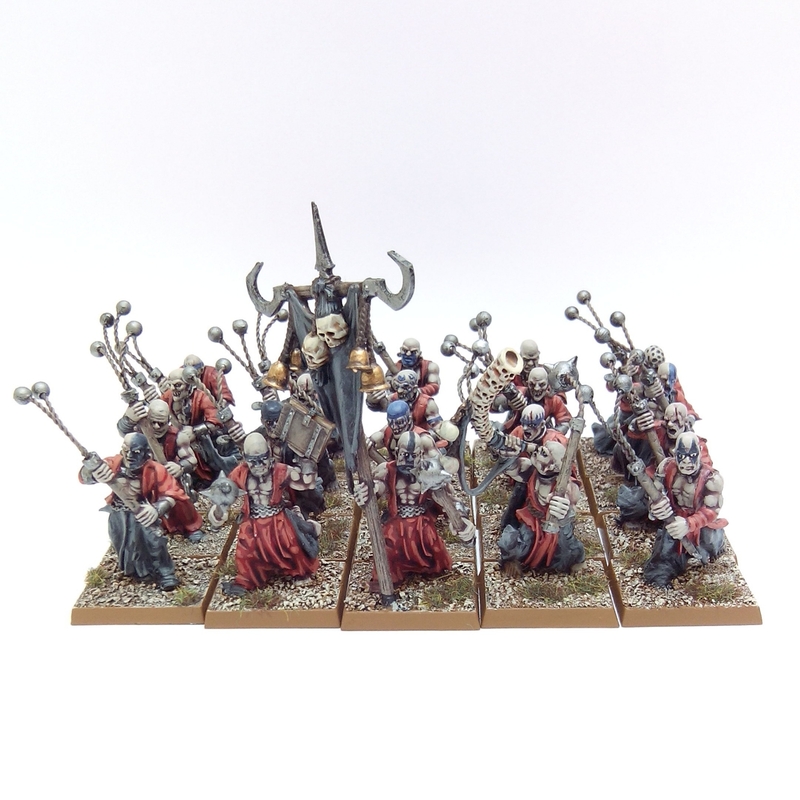 Last time I posted about my Evil/Chaos Warband I mentioned the next unit for it would hopefully be some cultists. Units of religious zealots spreading the word of the Dark Gods through murderous deeds has always been a favourite concept of mine in fantasy worlds. No self respecting evil horde of chaotic crusaders would be complete without a set of crazed lunatics chanting unholy prayers and bludgeoning anyone in their way. I’ve blogged before about an old Regiment of Renown set called the Disciples of the Red Redemption. This set and the fluff written for it in 1985 finally stirred some great game ideas for me 30 years later. 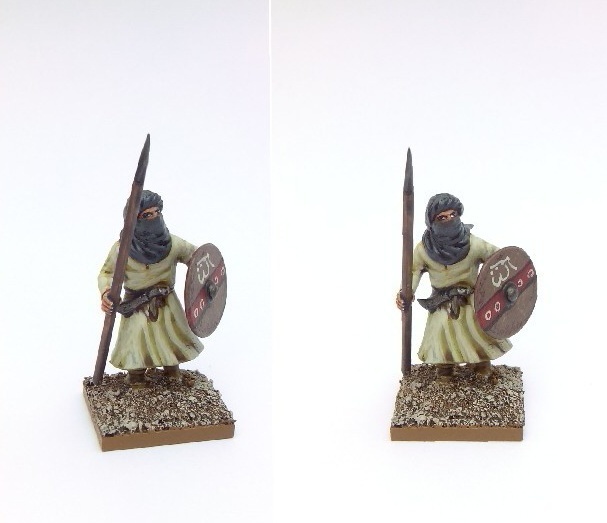 My modern version of this regiment based on the Ral Partha Chaos Monk model is on my project list along with the Avenging Knights of the Cleansing Flame using Mantic Basileans. I don’t really plan to incorporate these Monks into my Evil/Chaos Warband though. For the Warband I wanted something a bit different from just the Chaos Marauders and Warriors (infantry and cavalry) that are the mainstay of GW Mortal Chaos armies at the moment. These models pretty much summed up how I wanted my Cultists of Chaos to look. To be honest even before seeing these I’d considered using the Empire Flagellants as a basis. I dismissed it because the models didn’t look particularly conversion friendly. As proved above all the extras (hairy heads, Sigmar scrolls, burning braziers, figures walking in stocks, etc) are just additional pieces that are glued onto the main robed figure. The other problem I noted was the rather chunky looking flails that come with the Flagellants, some with symbols of Sigmar. The only option I could think of was replacing these with the flails from the Chaos Marauder set. On pulling these from the box to examine them they were pretty awful too – which explained why I hadn’t use them for my standard Marauders unit. The overly muscular arms of the Marauder flails wouldn’t really have worked either with the smaller Empire Flagellant bodies. Using twisted wire to replace the clunky chains and adding some 3mm metal beads as flail heads solved that. Rather than rag masks I wanted my figures to have heads with a shaved and tattooed look. Each Empire Flagellant box only has a total of 4 bald heads so I needed to find more. The closest in the Marauder infantry box is the shaved head with a top knot. This can be cut off leaving a bald pate. That supplied a few heads. Searching my bits box for extras I only found 1 more suitable head from a GW zombie so I set about buying a set of 12 bald Sci Fi heads made by Scibor off of eBay. Some of the Scibor heads are a bit large but I really didn’t want to wait any longer to finish these or have to purchase more figures just to use the heads. In the future I might replace these with some Mantic Ghoul heads if they start to bother me. I’ve obviously gone for the ubiquitous colour scheme of maniacal despots, evil priests and Dark Gods everywhere – red and black. The musician has a horn from the Marauders Cavalry regiment and the arm with the morning star was originally a Marauders infantry axe arm. 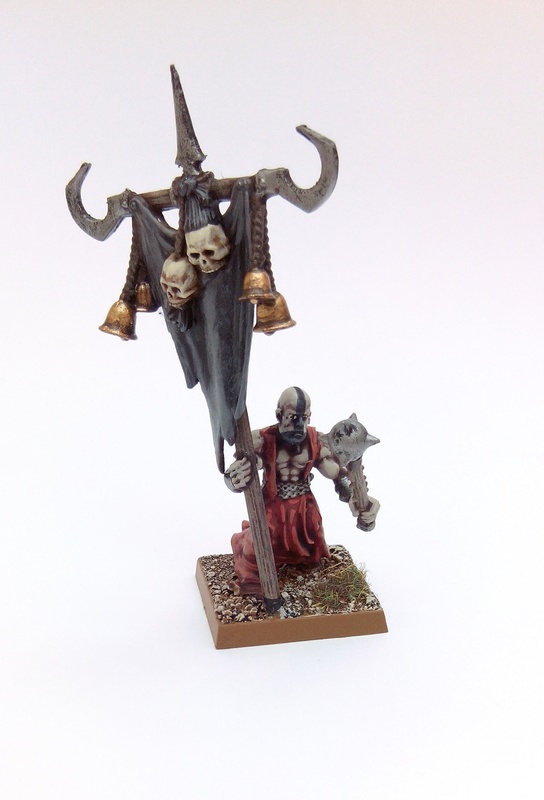 More Marauder bits were used on the standard bearer, the standard (with added bells from the Flagellant set) and an axe arm converted into a mace. I’ll paint something suitable on the standard at a later date. 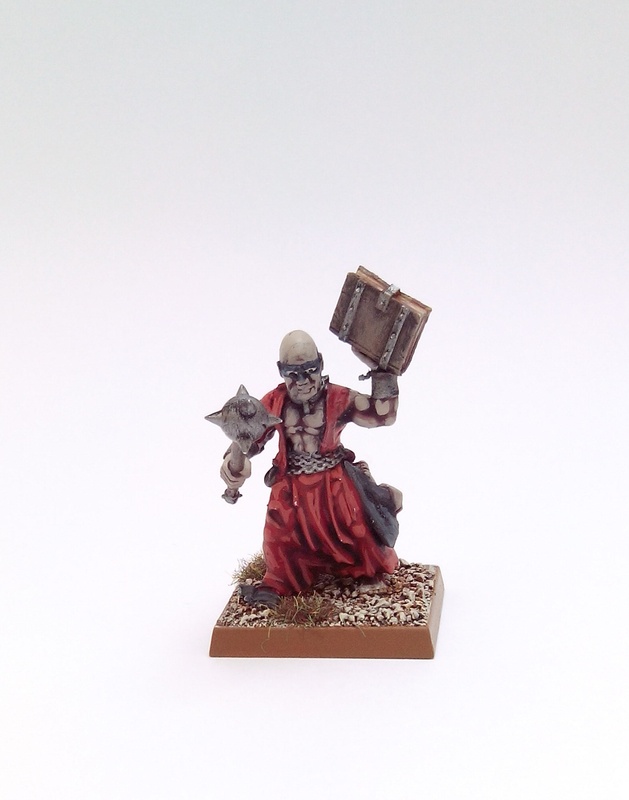 In a nod towards The Disciples of the Red Redemption and Darkhoth’s ‘Darkhold’ (a transcript of the original scriptive book of Khorne discovered by Eroneus Balbadron) I decided I wanted to make use of the books in the Empire Flagellant set for the leader. I used one of the hands from the head in stocks piece so he could hold the book above his head. This entry was posted in Post-1990 and tagged Chaos Cultists, Games Workshop, Warhammer on June 21, 2015 by Hobgoblin Orange. 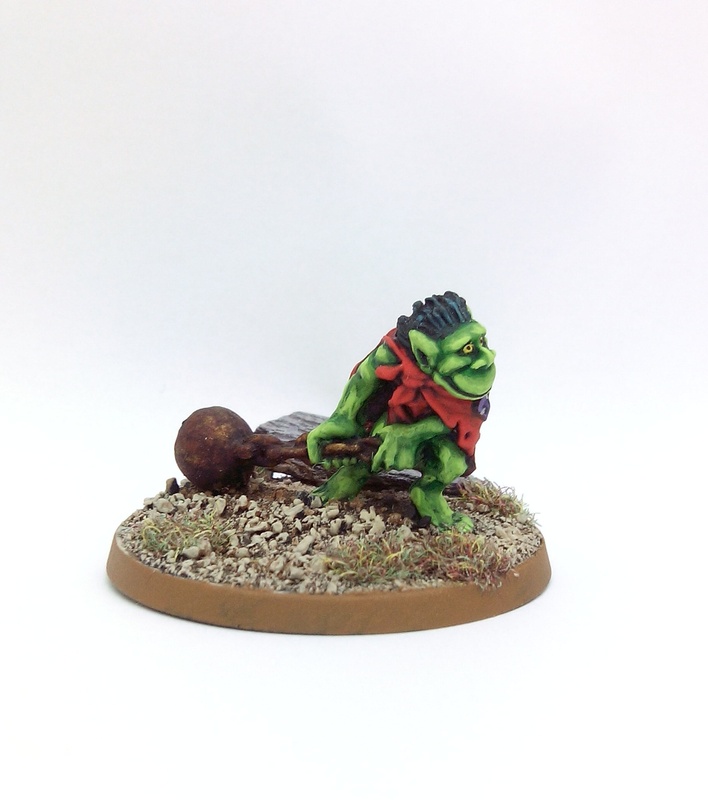 With my general apathy towards many figures deemed to be ‘Classic’ in the Oldhammer community the entire early/mid 80s C27 Goblin Fanatic range should be on my antipathy list. Let’s face it, they were a pretty ropey set of miniatures. These figures were overly ‘cartoony’, crudely sculpted by anyone’s standards and the weapons they had were preposterous – just what was that giant boomerang all about? That said I can’t bring myself to even consider disliking them even though they tick every box on my ‘everything wrong with miniatures in the 80s’ list. This entry was posted in Pre-1985 and tagged Citadel, Goblin Fanatic, Perry Twins on June 17, 2015 by Hobgoblin Orange. I had vague recollections of this figure from one of the early Citadel Journals or Compendiums. A quick look through the Stuff of Legends site confirmed it was in the 2nd Citadel Journal from Autumn 1985. For some reason I thought it was part of the Men at Arms/Demon diorama by Dave Andrews, John Blanche and Tony Ackland but my memory had played a trick on me – not really surprising after 30 years! It was actually painted by Charles (Chaz) Elliott. In the Journal there’s no clue to it’s actual code identity and is given the description ‘Elric of Melnibone’. For Citadel to use this title must surely have meant they’d already secured the rights to produce figures for Moorcock’s Multiverse, although the BC5 Eternal Champion box set (the first of Citadel’s releases based on Moorcock’s writings) wasn’t available just yet. With no clues to it’s identity I always assumed this figure was from the C01 Fighters range but I was wrong. It’s actually from an earlier range – ‘Fantasy Tribe Fighters’ (FTF) which originated sometime in 1982. The C ranges were introduced in 1983 and some of the FTF miniatures were incorporated into these. 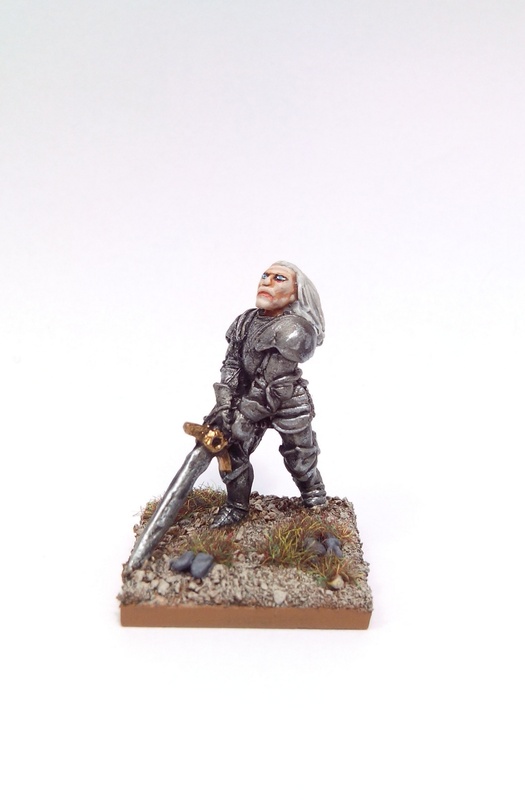 This miniature then made the transition into the C35 Knights of Chaos range. I never saw this figure for sale when I started buying miniatures from late 1984 onwards – I would have snapped it up if I had. This one is a recent purchase off eBay. 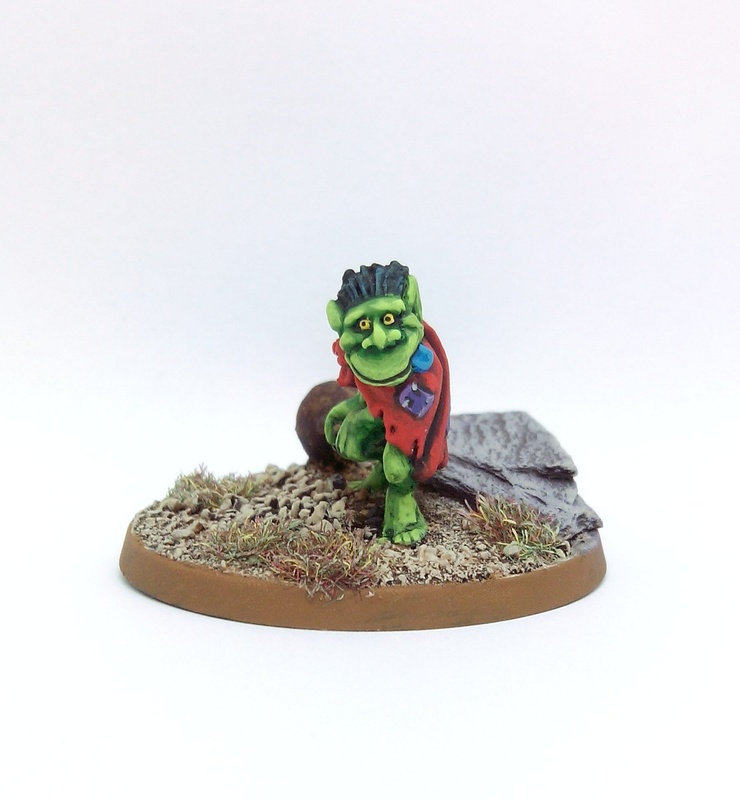 He was quickly painted up in similar colours to the Chaz Elliott miniature. I can’t say I’m happy with his eyes so chances are I’ll repaint them before he gets a coat of varnish. After he’s varnished I’m unsure whether I should give him a good splashing/flicking of blood effect. 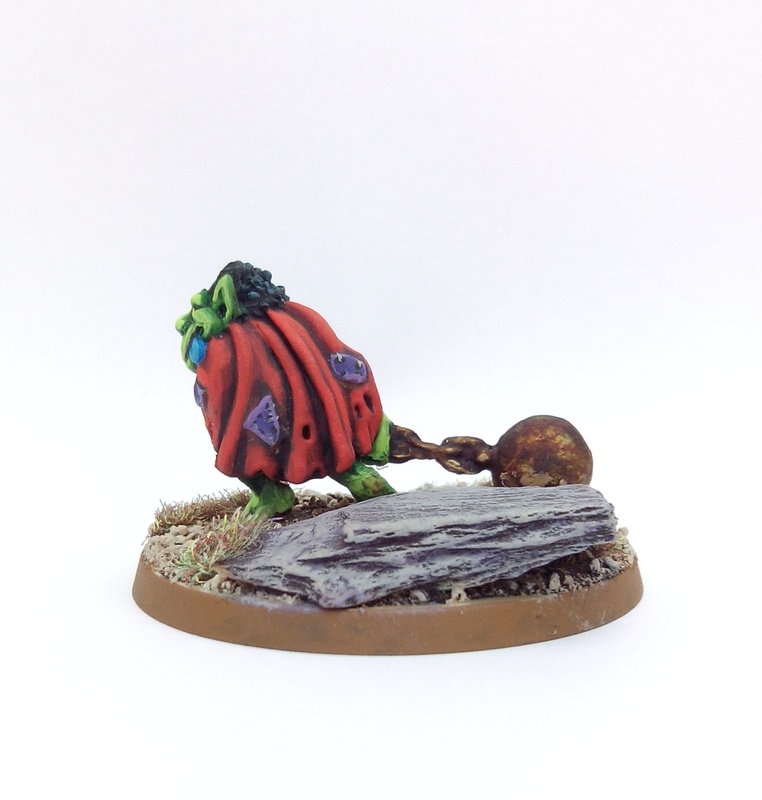 GW’s Blood for the Blood God – which can be used straight out of the pot. Tamiya X27 Clear Red – which gives better results in my opinion but needs to mixed with a little black to make it less ‘candy/lollipop red’ and more blood-like for my tastes. If you’ve never used either of these paints before I recommend you give them a try, just bear in mind they have to be applied AFTER any varnish to avoid ruining the glossy ‘wet blood look’ these paints give. 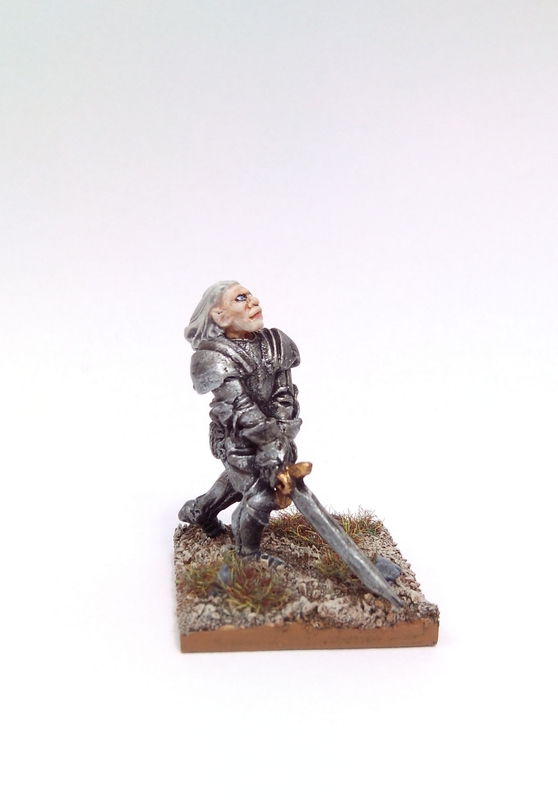 This entry was posted in Uncategorized and tagged C35 Knights of Chaos, Citadel, Elric, FTF-63, Melnibone on June 14, 2015 by Hobgoblin Orange. I’ve been GMing an RPG in my home written Arabesque Swords & Sorcery setting for about a year now. Having painted up miniatures for the other PCs I needed a bowman to represent a new one. 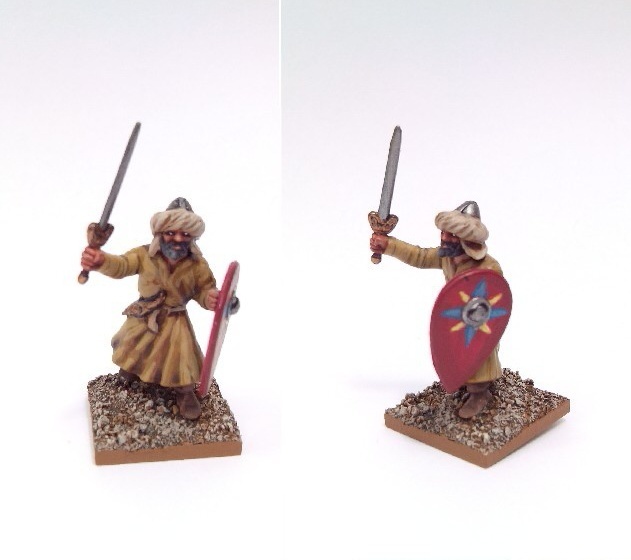 I bought a single sprue of 5 Gripping Beast Arab Spearmen/Archers off eBay as I knew I could make a suitable bowman out of these. I also wanted know just how versatile they would be for other projects without buying a full box. On assembly they look great and fit together well with minimal mould lines. They do exactly what it says on the box – only one sword arm (for a leader) and one arm holding a mizmar or horn (for a musician) on each sprue of 5 men. This means you have to assemble them as spearmen/javelins with a few possible bowmen unless you kit bash with arms from elsewhere to make more swordsmen. With only 2 archer arms per sprue a full box of 8 frames would let you make 16 archers out of 40 men. Head options include helmets, keffiyehs and tagelmusts. The uncovered faces are a mix of clean shaven and beards. 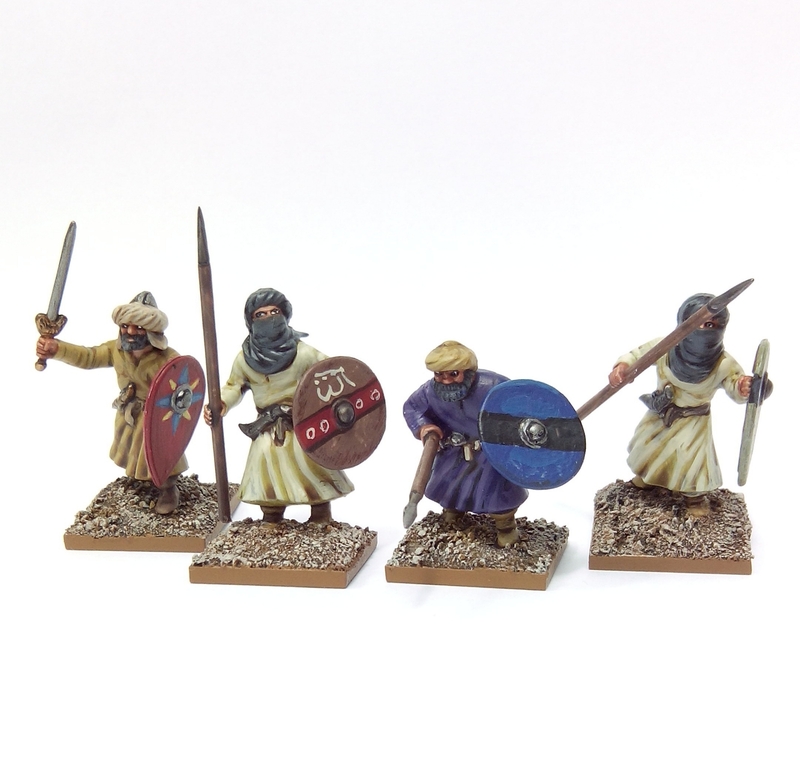 These figures have been designed to give wargamers a wide scope covering several periods. Fantasy gamers can use that too should they wish to represent different troop types. 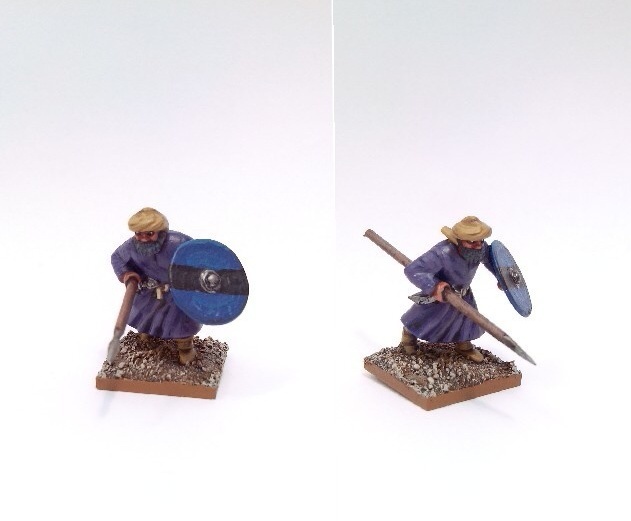 As with all modern multi pose plastic miniatures, if you intend to use these on individual 20mm bases you’ll need to be a bit careful gluing them together to ensure they rank up nicely – sticking out elbows, shields and thrusting spears can play havoc with that. Anyway, I painted up the Bowman and left him with the other PC miniatures at the player’s house where we play. This of course left me with the other 4 figures to play with. I painted these first 2 using the tagelmusts because I think they look great. I used simple undyed cloth colours against the black of the head wear to create a Bedouin or Berber look. The next 2 are more Moorish (sorry) with helmet and keffiyeh. The shields on all of these are ‘inspired’ (shamelessly copied) from shield decals to be found for sale on Gripping Beast’s website. 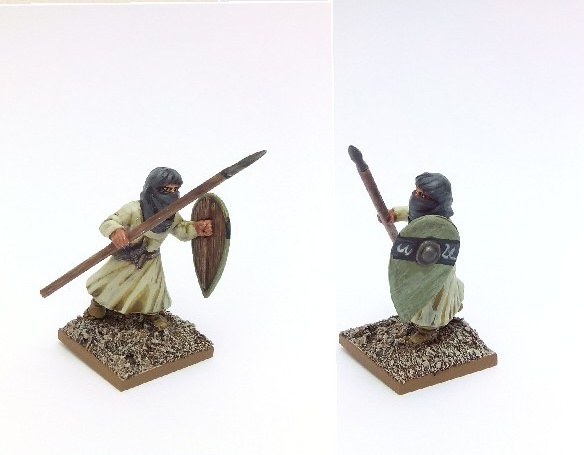 If (like me) you were trying to find a cheaper alternative to double as the Regiment of Renown Mad Mullah Aklan’d’s Death Commandos by Citadel Miniatures then these could easily pass if you were willing to overlook the spears or find replacement sword arms. I’ve also heard of people using these as Haradrim for Lord of the Rings which sounds like a great idea too. A couple of boxes of these are definitely on my want list for later projects. 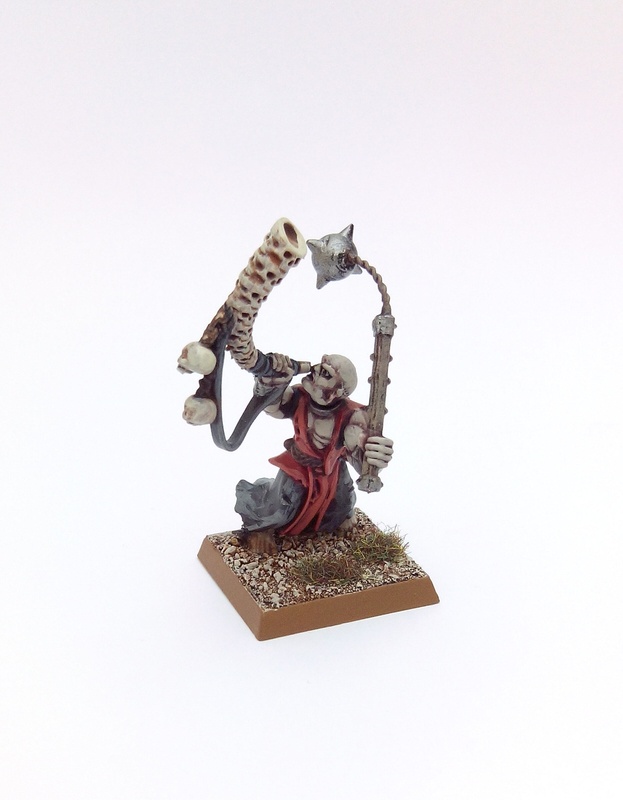 This entry was posted in Post-1990 and tagged Arab, Gripping Beast Miniatures on June 12, 2015 by Hobgoblin Orange.